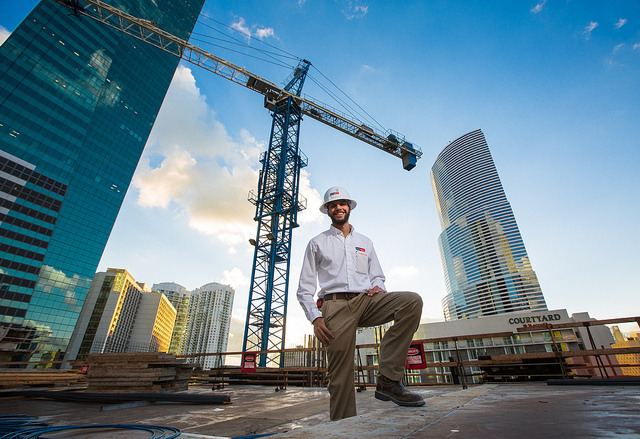 The Moss School of Construction, Infrastructure and Sustainability at Florida International University is committed to being the preeminent center for the advancement and dissemination of construction knowledge. The school fulfills its mission by imparting knowledge of the construction management process through expansion, excellent teaching, promoting public and university service, discovering new knowledge and solving problems through research, and fostering creativity. The Master’s degree is rapidly becoming the entry-level requirement for middle and upper level managerial positions in the construction industry. The primary goal of this program is to provide the knowledge and advanced skills essential for success in these positions. The program is flexible enough to accommodate graduates from other disciplines who may lack a part of the undergraduate background in construction management. Since the Fall 2004 semester, we have been offering online graduate courses that may lead to a Master of Science degree in Construction Management. Two to three courses will be offered each semester, with each course counting as 3 credit hours. Students have the option of earning their graduate degree by either taking all courses on-line or taking a combination of online and face-to-face courses. Prospective students who hold four-year undergraduate degrees in Construction Management or its equivalent in related fields may normally complete the Master’s degree in one academic year as full-time students. Equivalent in related fields should include studies in construction drawings, construction materials and methods, construction accounting and finance, economic planning, structures, site work, legal aspects of construction, cost estimating, construction scheduling and business management/finance. Students with deficiencies in these fields may need longer residence for the master’s degree, as they will be required to take specified basic courses. Students seeking to obtain a Master of Science degree in Construction Management have a choice of either a thesis or non-thesis option. The 36 semester hour thesis option consists of a minimum of 30 semester hours of coursework and up to 6 semester hours of thesis. The non-thesis option consists of 36 semester hours of coursework and may include up to 6 semester hours of independent studies.